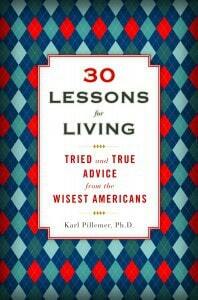 The Bookworm Sez: “30 Lessons for Living: Tried and True Advice from the Wisest Americans” by Karl Pillemer, Ph.D. Your great-grandmother never had a smartphone. Great-grandma probably never had a microwave, either. At some point in life, she washed her clothes outside and hung them on the line, which took all day. She grew her own food, sewed her own clothes, and learned how to fix things around the house – or she hired someone who could do it for her – all the while managing to raise a family. And you can barely muster the energy to fix dinner. One of the more popular spots in many bookstores is the Self Help section. We love to get advice on our love lives, our health, and ourselves. But when gerontologist and “advice junkie” Pillemer turned a Certain Age, he began to realize that the best guidance was right in front of him. With a list of questions and time to dig, he went on a “quest for wisdom” by seeking out people who were 65 years or older. He asked them for the best advice they could offer on love, relationships, health, family, and more. How, for instance, did people manage to stay married for decades? Marry someone a lot like you, Pillemer was told. Opposites attract, but opposing values generally mean trouble in a marriage. Get to know one another, be friends as well as lovers, learn to communicate, and forget about changing your beloved after the wedding. That ain’t happening. Since you’ll spend four or five decades making a living, choose a job for its intrinsic value and not because of salary. If you’re miserable in a job, find another one. Take a pay cut if you have to; it’s worth it to love your job. On the other hand, don’t put your work ahead of your children. Spend time with them, and never allow a rift. Be honest. Be open to opportunity. Choose happiness. Don’t wait. And know that being old is much better than you think. Imagine the outrage if one of this country’s best-loved treasures suddenly disappeared, never to be retrieved. That’s what will happen to a bit of our history when our oldest citizens are gone, but “30 Lessons in Living” helps in the preservation. 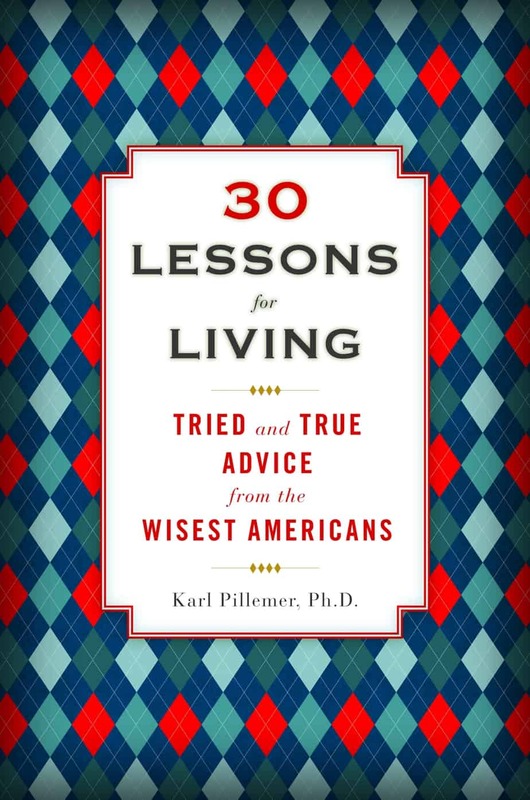 Through interviews with “experts” in life, author Karl Pillemer presents a two-fold gift to readers. First of all, there’s useable real-world advice that comes from the perspective of those who have survived, endured, and thrived. Secondly, there are stories of how those experts got to be where they are: tales of hardship, loneliness, risks, and love. Together, those two facets make this one book a pure delight. And because of that, I highly recommend it for anyone who craves words of wisdom and comfort. If age is just a number, “30 Lessons for Living” is number one.